All the children with their new Christmas bags (given to them by Sr Fedelis were off to school on the 7th! Two children Bianca and Samueli to our Parish Catholic English Medium School 5 km away– and thirteen of our children to the Government school in our nearest town. Our school bus picks up another thirty children through the day to go out of the village to local schools. 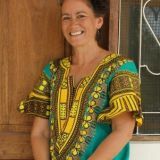 Since we started six years ago, either myself, Ester, or volunteers have done all we can to walk closely with our children doing homework with them, trying to fill in the gaps that we know are there due to the crowded classes and lack of funds. However, this year we are so happy to have found a young teacher in our village who since December has begun giving tuition to most of the children- especially the older ones. Teacher Flaviana, a just out of University Secondary School Teacher has copied the Syllabus of all the subjects of Pre- School up to Primary 4. She has her work cut out, so she is now being helped by our two new volunteers from Czech Republic. At the start of this year I want to introduce to you our wonderful team of Aunties and Uncles. All our Aunties, and Mama Mdogo - Harness, have been with us for some time: Early last year we were joined by Aunty Joyce, Aunty Lily and Aunty Sabina. Uncle Augen, our driver has been one of the family for over a year now and as well as being a driver over sees maintenance. We also had the joy of having Lusekelo return with his wife-Kristina and child. Lusekelo over sees the growing of crops, farming, and garden. Raphael who came 4 months ago works closely with Lusekelo, and both are wonderful Uncles to the children. We all at KARIBU NYUMBANI want to take this opportunity to thank you for your prayers, your love and support. For those of you who have supported us financially every month, or who have given us one off donations, we would not have survived without your generosity and love. Also to all those who have come and spent special time with us volunteering and to those who spend a lot of time and energy in England and Czech and Germany thinking about ways to raise funds. We have felt much loved. We pray every blessing for this Christmas Season, for you and your families. From Fiona, Ester, Ludmila and all our children. Our little three year old Florian often gets a runny nose and he said to me recently that he would like God to make him a new nose. I think even as get older, we might love God to make us a new in some way or other! Jesus had a thankful heart. When He was presented with the 5000, He was given a few loaves and fish. I just might have been a little despondent but He gave thanks to His Father! AND. It was changed into enough to feed 5000 with 12 baskets left over. St Paul says give thanks always! EVEN for the food we eat! WHY? Because just giving thanks has the power to make poisonous food edible! Having a grateful heart can change every situation. "Jesus said- "COME UNTO ME ALL YOU WEARY AND HEAVY LAIDEN AND I WILL GIVE YOU REST." Rest I think comes through an ability to trust. Tanzanians have very thankful hearts. If asked "how are you?" The reply will more often be "Fine-thanks be to God". Even in the midst of a difficult situation their answer is the same and they really mean it! They know that their situation could quite easily be worse, so they are thankful for what they have. Generally the poor have a wonderful ability to see God with them in everything. Emmanuel- God with us. Jesus is with us- Our Joy, the reason for our hope and thankful hearts. We pray for you all that He will give you more than you ever thought possible! JOY, REST AND THANKFULNESS. He is the Father of the Fatherless! I want to apologize to the regular readers of our Blog, for not updating our news since June. The site has had a few changes and has been moved, so, I will try now to give you a window into our last 4 busy months. Two months in England is such a different world for me now- I love it- but it’s a long time to be away from my children. On my arrival I met our volunteers from Czech. They arrived in May to stay for 3 months, so they were quite at home when I arrived. They were dedicated to the children while they were with us, teaching one on one with the small ones and group English with the big ones. Truly they were such ablessing – God bless you all. I n early July, Mama Hilary, now her fifth visit, came with Mama Gloria who had waited for 3 years to come but was unable to because of sickness. It was such a joy to have them both with us. They painted, worked in the office, played with the children- rested and prayed. Their Churches in Farnham have been such a support to us, and now Hilary and Gloria have decided to be our “Ambassadors” – as they really carry in their hearts a desire to find support for our children. ? MAX AND FLORIAN- we miss you both so much! We were sorry not only to say good bye to Max and Florian, but they were also our last “Caritas” volunteers. Truly they are part of our family- like 2 big brothers to the children- and always will be. Not knowing each other before they came- they worked together so well and were a blessing to us all. They taught the children more than we will ever know, but also Maths, English, computer, drawing, to make games…please come back!! Hello Helen! – This young lady came back after being with us a few years ago. As you can see another member of our now extending family! Mama Mia was kept busy in making her new patchwork trousers and Helen kept herself busy in every corner of the place- sewing, office, kitchen, and most of all just being!! Enjoying herself with the children. Her three weeks just flew by! We hope all is going well at Uni! HELLO TO LYNI AND ROGER! Never been before, but when they walked in the place, it was like they had always been with us. Immediate Grandparents to the kids. And only one weeks stay!! Truly a precious time, and I look forward to seeing you here again. Thank you so much. And the children want to thank you for their time at the swimming pool, which was a gift from your Church! - A BIG THANK YOU TO YOU ALL. Ludmila’s and my dear friend Kat, visited us too in August. She is a teacher in Poland, and is praying about coming to join us!!!! We would love that! In September, we had the joy of meeting Bibi Rafael and Rafael himself- aged 3+ and a month later Emmanuel- 4+ and his Bibi! (Grandmother!) Both children needing a home as neither really had a home. They have both settled very well and are greatly loved by all. So we now have10 boys and 10 girls!! We are well and we have missed Ludmila over the last 2 months. The above, Ester, (left) and her sister (right) – Mama Mdogo (little mama) Harness. Enjoying our own Bananas! We have been joined by 3 new Aunties in the May, while I was away, Joyce, Lilian and Sabina, and they have settled in very well. We want to thank everyone for your love for us. Especially Mama Hilary for your birthday gifts you have sent us over the last few months. Isaya is here opening his birthday present- everyone is excited! When Fiona asked me to create a 4 to 5 minute movie for Karibu Nyumbani to go on the website I had many reservations that I was going to be able to do this. I had never created a movie before let alone one that was to be seen by many! In our planning, the question of music came up. Being a music teacher meant I was aware of copyright rules and was unsure how to get around this easily. Our solution was to write our own song for the movie, of which I had also not really done much before, snippets yes but not the whole process, also not in Africa with very little recording equipment, software or people to ask “how to”. I also had not overseen a project with different languages, ways of communicating music and style. I took a deep breath and said to the lord “if it’s of your will, I will do my best”. It was late into my stay that this project started so we were racing against time. Fiona made contact with a local musician to be the Fathers voice, and wonderfully he came to Karibu Nyumbani to record, using my IPhone. In between rain and the children being at school we managed to share our desire of the song, Fiona’s words and with some Aunties as well the song took shape. So much learning has gone into this movie, it has taken me so much longer than I had hoped to get to this point of sharing it, but the Lords taking me on my own journey and I am learning to trust his timing in all things. From the lonely flute playing at the beginning of this movie, played live by Fiona herself, to the chant of the Father at the end saying he will never leave us, creating this movie side was a journey that will be with me for a very long time. While I travel during the next month, I will be talking to a number of parishes and individuals to thank them for their support in the past, but also to ask for more help. This is a priority for us at the moment!! Please pray for me as I set off from Cornwall tomorrow. Last week I was walking with my Father and his dogs along the Falmouth seafront when we met a woman who asked if we could pick up one of the dogs for her to stroke. She then explained that she had had a car accident and was suffering from severe whip lash which left her unable to bend. So typical of my father he said, “We know someone who can heal you”. Within a minute or so the lady was healed, bending to touch the ground, telling the passersby that she had been healed. Nearby I saw these words graffitied on a wall :-“Leap into the void” and they echo what I am thinking about just now. God called Abraham before he knew where he was going and promised him descendants as many as the sands on the seashore- humanly impossible! It seems that unless we are called out of the “What’s Possible” we will never see the” Impossible” workings of the Holy Spirit in our lives. The Lord turned fears into faith, weaknesses into strength and led both Ester and me to step out together, so that the Lord himself could build HIS home for his children. With each new step of faith, there is a testing – a void, but as we jump -the Lord turns fear into faith, stress into rest, weakness into strength. People are healed on the streets, Children find homes, and the kingdom of heaven comes on earth. Please continue to pray for us that we can hear the Lord’s voice and be obedient. I’ve arrived in England and apart from a few very cold days it is now one of the hottest Mays! 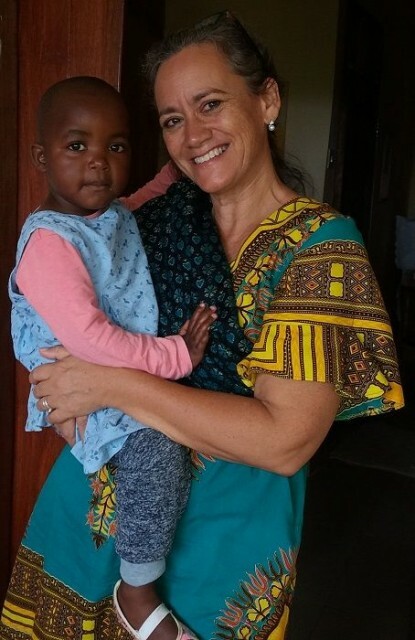 Leaving my lovely family in Tanzania is never easy and I am very thankful for the gift of What’s App, so that I can be in touch with Ester, Ludmila and the children most days. Our biggest news since Easter is that we have a very beautiful- little 3 year old girl, called Tumaini, which means HOPE. She has spent the whole of here little life until now living in a hospital after her mother died during childbirth. She is adorable, with a lot of character and all the children love her to bits. We all need the gift of hope. Whilst catching up on news, I’ve been hearing the phrase ‘”when I was just about to give up” and ” when I was just at the end of myself,” and” last minute the lord stepped in.” Our Father never leaves us, He gives us homes, he looks after the widow and the orphan, and He looks after you and me, in all our ups and downs, through all our struggles and traumas. Nothing can separate us from our Father’s love and He loves it when we trust him for every detail of our lives. MAMA NDOGO HARNESS AND AUNTY REHEMA’S CHURCH- Pig farming again!! One of the lovely things about our Karibu Nyumbani family is that we are blessed to have members of different churches. This week we had a visit from Harness and Rehema’s church, they came with gifts and also to talk and pray with the children. One of them, the wife of a man we sold some pigs to before we had a tragic death of all our pigs, came to tell us that she and her husband wanted to gift us with a female pig. SO, we will start or pig farming again, as this week we also heard from Fr Ettiene at Agape Community that they too wanted to bless us with another Male and Female pig!!! We are so grateful for everyone who sends gifts via volunteers, of visitors or with me or Ludmila when we travel. Last year when I was leaving the “Terefenko family” they gave me the gift of their pencils. They are only used for special occasions! -THANK YOU! For the last few weeks I have been sitting in on the children’s Saturday afternoon “Sunday “School in the village church, just to help with ideas. This week Florian and Max have been busy preparing pictures to inspire the children to do their own pictures to be used to pray the Rosary. Our chapel has not had its official opening, but we have been blessed to have Fr. Mkandara come and celebrate Mass and baptize 2 children. Nearly half of our small village church (not yet a parish!) came to celebrate with us. We thank Fr. Benno our Parish Priest who during his busy schedule always has time to come and support us when we need and encourage us in with in our call and vision. Only six years ago Ester and I came to pray on this land when it was all bush! Now we are standing in the same part of the land in our lovely chapel! I can hardly believe how much the Lord has done! Just to feel the Glory of the Lord in this place lifts your heart to sing! Lord we pray for your vision to be revealed and unwrapped in your perfect timing. AMEN! This is a project that we have needed to move forward as quickly as we could due to safety. However, expert advice was sought to ensure that heavy rains will not carry it away again! As you can see, it is looking like a castle! Bianca and Samueli started school this month too. They are going to our Private Parish School – Don Bosco 20 mins away. We want to thank Mr. Mishili a good friend, who has been receiving orphans into his own school for many years. Knowing how we did not want our young ones to have to go to boarding school at this early stage he agreed to support 2 children at a nearby school. So, Bianca and Samueli are now at an English Medium school. He has also said that if we are to start a school in the future he would like to pay for them to go there! Neema came to us at the age of nearly 3 and when she came she could not walk or speak. Her mother died when she was born from an epileptic fit during delivery, and Neema was affected by a lack of oxygen. She spent the first part of her life in hospital limited to sitting in a cot. When she arrived with us we took her to a doctor who said that she may walk but probably not until she reached 5 years old, and speech would be slow too. Neema has been so loved by all the children and all our Aunties and volunteers. We had a very special group of volunteers from England – Holy Angels-Surrey, a group of 8, who they came for 3 weeks. They spent every moment of their time with the children and Neema was lifted on her legs all the time for exercise. When she first came if she fell over from the sitting position she could not get up. When she started to get up herself, the children would clap and cheer her. She then made herself fall so that she would make everyone cheer. Then she started to stand to more clapping and cheering, so she was eventually walking within six months of us taking her to the doctor! This month she has just had her 5th birthday and has started school. We are sending her to a small private school so she has more care. She herself has epilepsy, but rarely falls because of her medicine. We want to thank all who have been praying for Neema and who love her dearly. She is truly a treasure, and a testimony of how prayer, love and joy can change a person. God bless you all.